All the products we offer at the online store are also available for sale at our 2300 square foot retail shop located in Joshua, Texas. 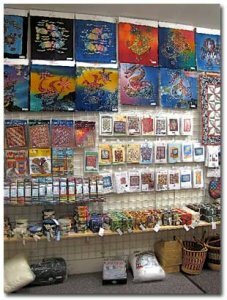 Our store stocks everything you'll need for your batik project. 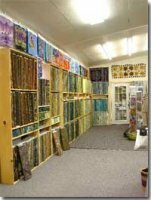 We carry a comprehensive selection of all things batik, starting with one of the largest inventories and widest selections of high quality batik fabric in the Dallas/Fort Worth area. Our support staff is comprised of friendly, product-knowledgeable individuals who's primary focus is individual customer service and satisfaction. Clear your calendar and come spend an afternoon browsing over 2200 bolts of beautiful, high quality cotton and rayon batik fabrics. Our fabrics are purchased from the most highly regarded and well respected manufacturers in the industry. 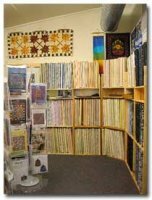 Explore a large selection of batik patterns, books and kits from both nationally recognized artists and talented unknowns. While you're here, don't forget to stock up on essential quilting supplies and accessories. We carry a variety of helpful tools and sewing notions, including rotary cutters, thread, and Best Press, to name a few. 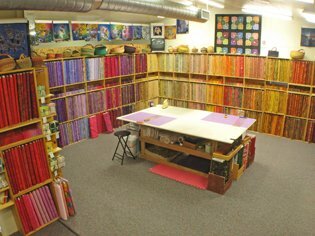 Long-arm Machine Quilting - Our shop utilizes Statler Stitcher© software in combination with the Gammill© Long-arm quilting machine to produce uniquely creative patterns and designs. Prices start at 1.5 cents per square inch. Call to make an appointment. Our passion is batik. It's all we do. This commitment to a single product line makes us unique among our competitors and ensures peace of mind for our customers. When you buy from us, you can rest assured that you're purchasing the finest quality batik products available on the market today. It's not just about a quality product either. We pride ourselves on a client-centric business philosophy that specializes in individual customer service. Drop by and let us show you what we mean. Our expert staff will spend as much time with you as you need. When you need batik, count on Batiks Galore! Barbara was always a stickler for quality, as anyone who knew her is aware. She worked hard to build solid relationships with industry leading manufacturers in order to bring you the best of batik.